1. In a nonstick skillet, roast the semolina over medium heat for 5 minutes, stirring constantly, until it turns a shade darker. Take off the heat and set aside. 2. In a heavy nonstick saucepan, heat 1 tablespoon of the ghee or butter. Add the cashews and raisins, and saute over medium-low heat for 1 minute, until the cashews turn light brown and the raisins plump. Add the water, sugar, saffron threads, and cardamom, and bring to the boil. Reduce the heat to low, and stirring constantly, slowly pour the semolina into the saucepan. Keep stirring until all the water is absorbed. Stir in the remaining ghee or butter. Simmer for 2 minutes. Serve hot. 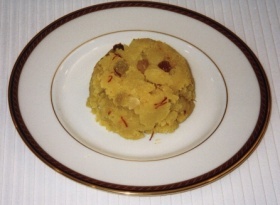 Roasted cream of wheat is laced with golden raisins and saffron threads. This quick and easy dessert tastes great served either hot or at room temperature.